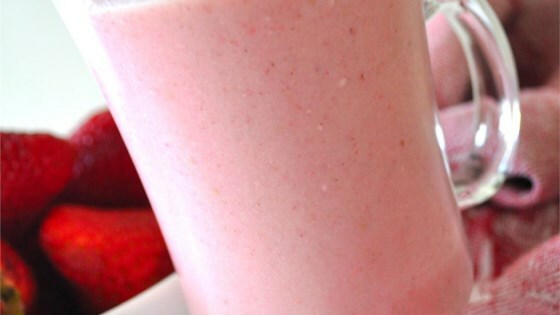 "You'll love this icy cold strawberry smoothie." Fresh berries, skim milk, plain yogurt, and vanilla make a 5-star smoothie. My husband nor I cared for this drink. It also left a bad taste in our mouth after drinking it. Definitely not a keeper. This is good, I recommend using Vanilla yogurt unless you like the tartness of the plain yogurt. Add more strawberries..it'll be like strawberry yogurt if you only put six... I put ten.. Kids loved it! For a second batch, we used a package of sweetened frozen strawberries (thawed) along with a banana. Tasted great also and a little quicker to make. Great base recipe! I cut the sugar in half, added half a banana, and used vanilla yogurt. All I can say is AWESOME!!! Awesome Awesome Awesome Awesome Awesome Awesome Awesome Awesome Awesome Awesome Awesome Awesome Awesome Awesome Awesome Awesome !!!!!!!! !